Defending the Caveman, which holds the record as the longest-running solo play in Broadway history is coming to Maryland Hall for the Creative Arts in Annapolis on Friday, April 26th at 8:00 pm for one performance. This performance is a fundraiser for the Anne Arundel Conflict Resolution Center. 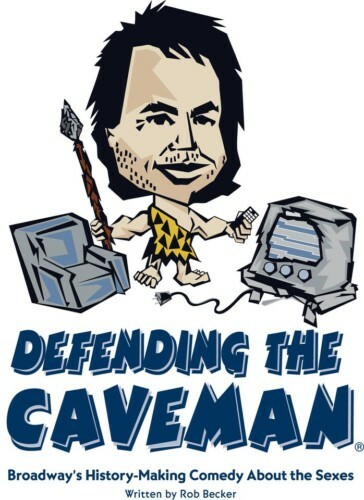 Described as an “outrageously funny and surprisingly sweet exploration of the gender gap,” “Defending the Caveman” is a one-man comedic play, written by Rob Becker, about the misunderstandings between man and women and how they relate to one another. Some think that men and women have held on to the roles they played back in pre-history and that we continue to see the world very differently. This often leads to a lot of conflict! Vince was a finalist in “Philly’s Last Comic Standing” and appeared in New York’s Midtown International Theatre Festival starring in “What Fools We Lovers Be.” He has been performing in “Defending the Caveman” since 2004. “Caveman” originally opened in San Francisco in 1991. It has played to sold-out audiences in 45 countries and been translated into 18 different languages. AACRC, located in the Heritage Center on Riva Road in Annapolis is a non-profit helping with the non-violent resolution of personal and community conflict. It provides mediation, anger management training, and other services to individuals and groups, neighbors, students, prisoners, businesses and more. Tickets to “Defending the Caveman” are just $45.00 with VIP tickets offering premium seating and a reception before the show, at $70.00. They are available online at the Maryland Hall website www.mdhallarts.org. For more information, please contact AACRC at 410-266-9033 or via the website at www.aacrc-md.us.